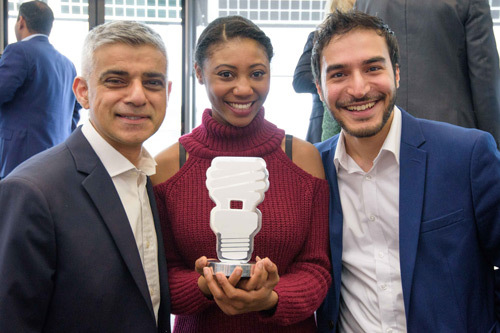 City student startup Twipes has won first prize at the 2017 Mayor’s Entrepreneur competition. The competition challenged London students to think of ways to improve the city, make it more sustainable and reduce carbon emissions. 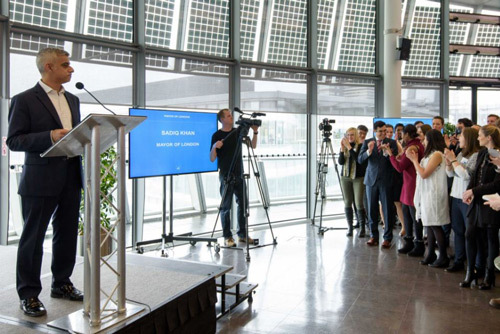 Following a ‘Dragon’s Den’ style pitching event at City Hall, Alborz Bozorgi (Cultural and Creative Industries, 2017) and Ellenor McIntosh (Business Administration, 2016) were announced the winners. They were presented with the £20,000 prize by Mayor of London, Sadiq Khan. Elle and Alborz invented Twipes to tackle the environmental issues surrounding wet wipes. Twipes are hygienic, water-dispersible wet wipes on a roll designed to fit into existing toilet roll holders. They are free from harsh chemicals and dissolve in water within three hours. This makes them an environmentally-friendly alternative to existing wet wipes currently on the market that don’t degrade quickly and can cause serious issues and damage to the drainage system. After winning CitySpark in 2016 with their idea, Twipes moved into City’s student startup incubator, the Launch Lab, to develop the idea further. Before studying a business short course at City, Elle did a first degree in biomedical science and this strong scientific background came in handy when developing the product. They have now created a novel formula of wipe made from wood pulp that disperses in water and have developed prototypes of the packaging. The City team were selected from more than 300 entries to take part in the live final of the Mayor’s Entrepreneur competition on Monday 20th March. They pitched to a high profile panel of judges including perfume entrepreneur Jo Malone MBE, Channel 4’s Jon Snow, Jenny Tooth OBE from UK Business Angels Association, Niels Kirk from Citi, Christian Lane from Smarter.am and previous winner Arthur Kay from Bio-bean. Each competitor was judged on originality, practicality, clarity, longevity and importantly – carbon savings. Twipes beat tough competition from UCL, King’s College London and Imperial College London to be named the overall winners. As London’s population grows the pressure on our infrastructure increases with it. Alborz and Ellenor are to be commended for tackling this challenge head on and they should be very proud of what they have achieved. I’m hugely impressed by the quality of entries. It’s testament to the creativity and talent in London’s world-leading universities that such a range of innovative solutions have been developed to make our city a better place for future generations. The team recently won €20,000 from the CT4a climate accelerator programme to help progress the idea. Founder Elle also won the UK semi-final of the Women’s Startup Competition and will be competing in the European final in June. Twipes are currently in the process of manufacturing their first batch of 5,000 Twipes rolls and aim to be stocked in various retail outlets by May 2017. Alex describes Twipes as a “true success story” for CityVentures. They graduated from CitySpark winners 2016 to the Launch Lab residents this year and are achieving amazing things. These are the success stories we love and it really emphasises how integral entrepreneurship is to the success of students. Alborz and Ellle are central to the City Launch Lab community and bring brilliant energy and inspiration for students and graduates looking to take their business to the next level.